Geocaching is basically hide and go seek, but with inanimate objects. Such as rocks, which are a segment of geocaching that has recently become very popular around the world. Geocaching has been a part of Ocracoke for a while now. All around the island you will find capsules with plenty of signatures on the paper inside. 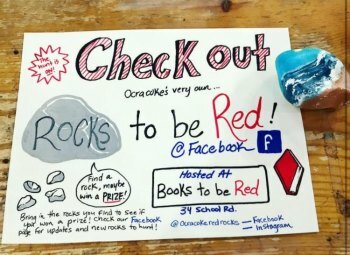 Books To Be Red now has a project called “Ocracoke Rocks To Be Red.” Here’s how it works: Painted rocks are hidden around the village. Whoever finds these rocks can bring them to Books To Be Red and receive a prize. 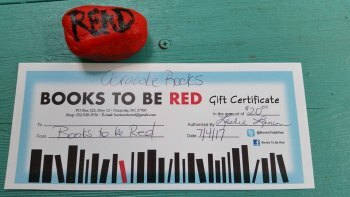 "I decided to start the rocks project on Ocracoke after talking to someone from Stafford, Virginia," Books to Be Red owner Leslie Lanier explained. "She placed a rock on the lawn at Books to be Red, and was telling me about the rocks and the Kindness Project. It just made me happy. I love rocks and thought it would be a fun idea to encourage on Ocracoke." The first Rocks to Be Red rock has already been placed and found, although it was not turned in for the prize. The second rock was placed and found, as well. A woman from Wisconsin found the second rock and turned it in for a gift certificate. It’s fun to get creative. So paint your own rocks and lay them around Ocracoke Island. Have your friends find and hide the rock again, it makes for a great summer pastime. A family found this rock on the rooftop deck of Howard's Pub last week and and re-hid it on Ocracoke. It's not a Rock to Be Red, but it was still fun to find! So keep a lookout for interesting rocks around the island! They’ll be hiding easily enough for the naked eye to see. Be sure to follow the Instagram and Facebook account for Ocracoke Rocks To Be Red for future updates. Caroline Novak is spending the summer working at Books to Be Red, where she has the opportunity to sell books and paint rocks! She'll be a junior at Ocracoke School this year.